It was made for a KRISS!!! Looks really good . Was it really made for kriss ? 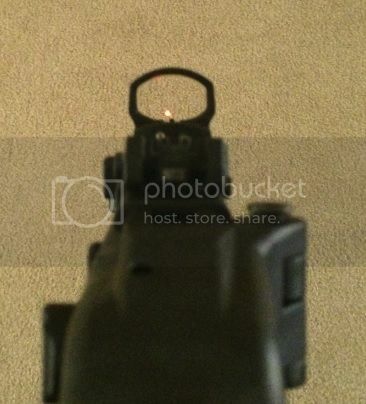 Do u have and pics of how it looks when aiming down the sight ? Sorry, traveling for the next couple of weeks so no pics will be available. IMO, personal preference plays a big role as well as how you see using your Kriss. I didn't physically check out sights but did a lot of research before settling on the Leupold VX-R Patrol 1.5x4 SPR . My second choice was the Aimpoint H-1. Each of these sights does something a little different than the other so it was not an easy choice. Anyone have more pictures with eotech xps2 or xps3 ? How does it look mounted on the gun does it fit perfect it's not to wide ? 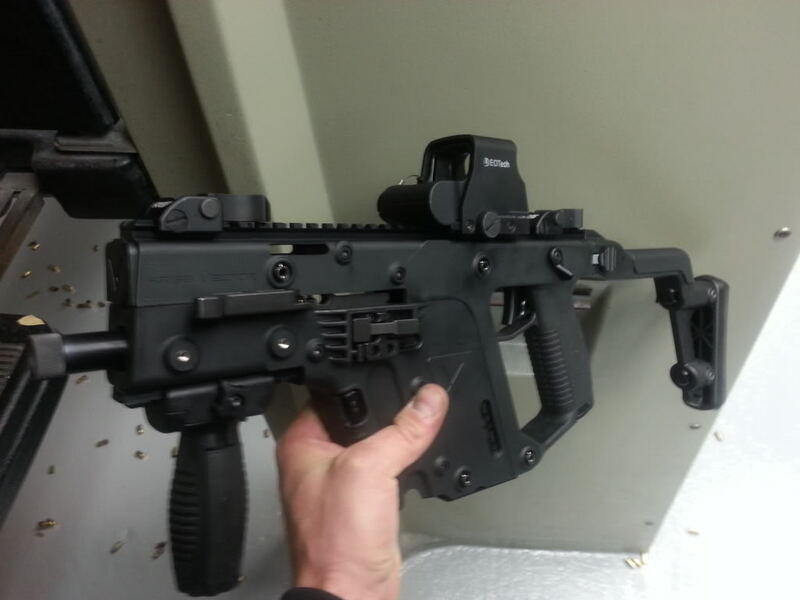 My Vector with an EOTech XPS-2. How much wider is the sight than the gun ? It's about 1/4 inch wider on each side compared to the upper housing, but it's still not as wide as the rest of the controls on the gun. Ok cool u wouldn't have a pic of it from a top view ? 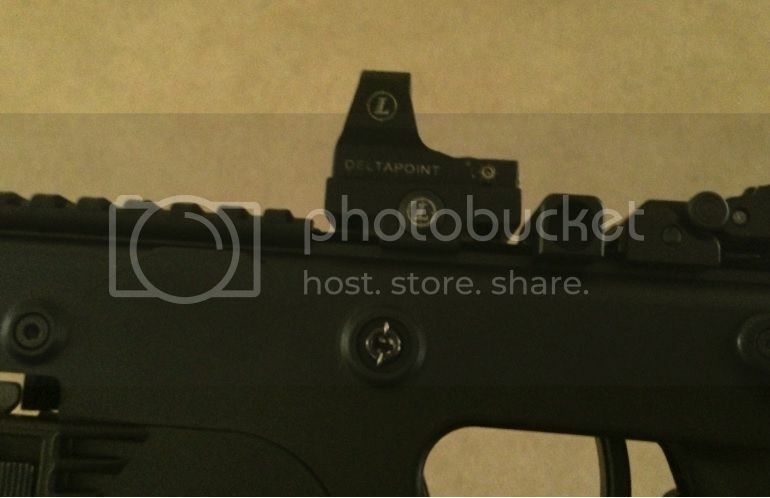 nobody on this forum likes the delta point on Kriss but me, i'll keep lobbying for it though, i think its perfect, its super durable, it's light sensing so changes brightness automatically, it's motion activated. It's super light. The battery last forever. It's as wide as the rail. I have the 7moa triangle, i'd get the 3 moa dot if i bought again but triangle isn't bad really. i have a 30' zero on top of it and its about 50' zero center of bottom edge of triangle. +1 for Eotech XPS 2.0. The site is virtually the same width as the gun. Since the Kriss really shines at CQB, the 65 moa outer ring of the reticle of the Eotech is perfect for super fast target acquisition. The center 1moa dot is great for longer shots, but how far out do you plan to lob a .45? Past 100 or 150 yards, I'll grab my AR, which happens to be topped with and EXPS 2.0 and 3x Eotech magnifier. FYI the EXPS is 7mm taller than the XPS, has buttons on the left side of the optic (for use with a magnifier), and a QD Mount. The XPS is great for the Kriss since it mounts lower. Do you know how wide the vector is ? I have the EXPS and I think its too bulky. It works fine but I would rather have an absolute co-wittness. I just ordered a Micro H1 ($475 & free shipping) but I need to find a mount for it. Kipp wrote: I have the EXPS and I think its too bulky. It works fine but I would rather have an absolute co-wittness. I just ordered a Micro H1 ($475 & free shipping) but I need to find a mount for it. Odd. I'm able to get an absolute co-witness with my XPS2 and the stock Diamondhead sights. NOt the clearest pic, but you get the idea.